It’s bad enough to have to do the walk of shame, but spending time searching for an ejected battery or action camera adds insult to injury. Unless you have a fancy self-powered buzzer, sending your battery off to parts unknown can make it much harder to find your quad, too. 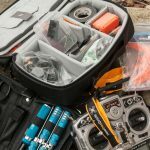 Rotor Riot believes they have the answer and brings us the Ummagrip and Nomojel, super-sticky pads for your battery and action camera. 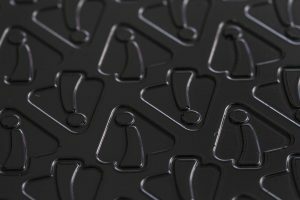 The Ummagrip sports a logo for its surface texture, letting everyone know it’s a Rotor Riot product. 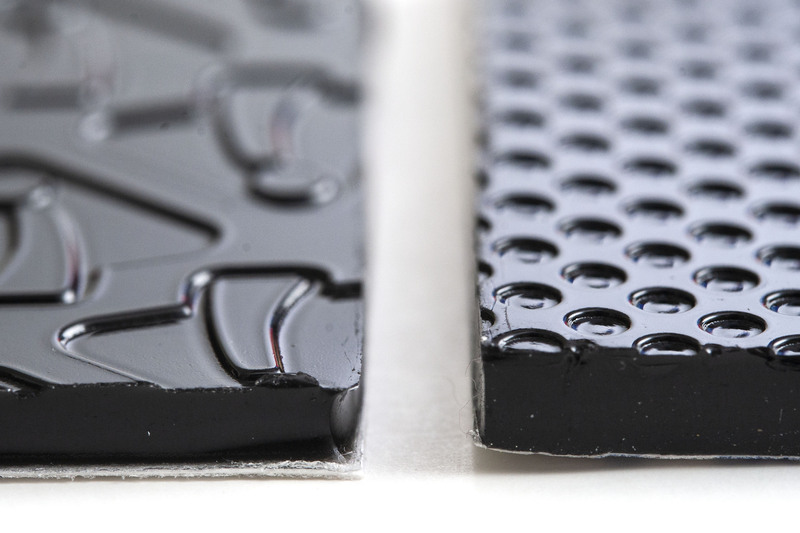 Both Ummagrip and Nomojel are made from the same material. The Ummagrip is a bigger, thinner pad (100mm × 50mm × 3mm thick) meant for batteries, while the Nomojel is half the size but thicker (50mm × 50mm × 4mm) and meant for action cameras. 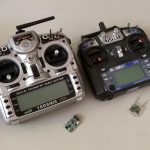 In both cases, the recommendation is to use in conjunction with a high quality strap like the rubberized versions from RaceDayQuads or NewBeeDrone. 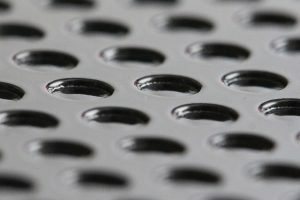 There are generic versions of this same type of material, but are generally offered in less useful shapes like circles and triangles. Each pad is a little larger than you’ll want, which isn’t a bad thing at all. You can trim these easily enough with a good pair of scissors, and the repeating patterns help you make a straight cut. Usually I prefer a ruler and a hobby knife for cutting, but for this material I found that the scissors left a cleaner edge. 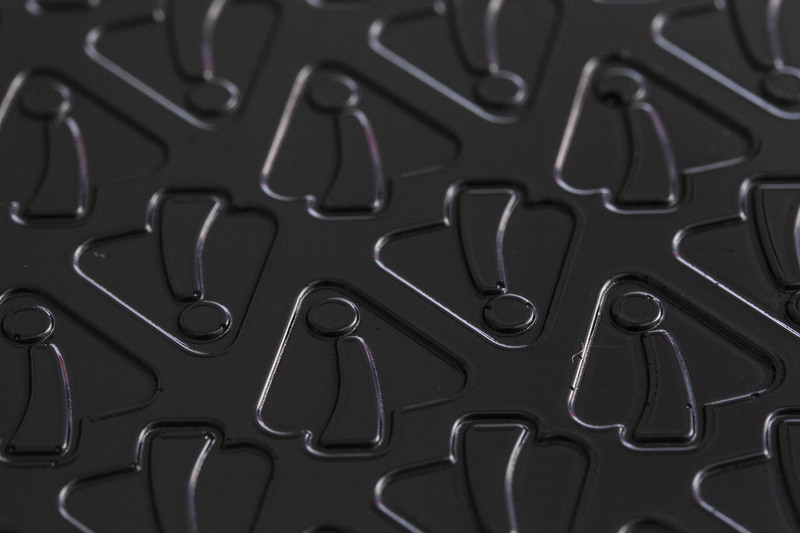 These pads have pre-applied 3M adhesive, so once the pad is cut you can just clean the area where you want it, pull off the backing, and stick it down. Each pad is shipped with a plastic cover. Keep this on until after you cut the pad to size and place it. After that you can discard it or put it back on when it’s not in use so the pad doesn’t pick up dirt while packed away. Nomojel’s texture is simpler and just contains rows of divots. Each pad has a decent grip strength against flat objects. Our batteries typically have large flat sides, which is a good match. Objects with more surface contact will hold better, so for example a traditional elongated battery will hold better than a cube-style battery of the same mass. Pressing the object onto the surface helps more of it come into contact and grip more firmly. Anything foreign that takes up surface area will reduce the grip strength—dust, dirt, grass, sand, oil from your fingers… whatever. You’ll get better performance out of the pad if it’s clean, but to get the absolute best performance, the battery you’re sticking to it should be clean as well. Cleaning the pad is pretty easy; just take a wet lint-free cloth and wipe it off. The pad loses its adhesive properties when wet, so dirt and dust wipe right off. On the other hand, once you do this you’ll need to wait for it to dry in order to be fully grippy again. It doesn’t take long, but at the field right before a flight may not be the best time to do your cleaning. 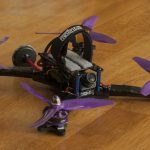 The FLOSS 2’s design means an ejection might send the battery into the props. The FLOSS 2 is a top-mounted battery, which appears to be the expected usage of the Ummagrip. The Remix frame it was designed for has it installed this way. I’ve outfitted my FLOSS 2 with the strap it came with alongside a rubberized strap from RaceDayQuads. 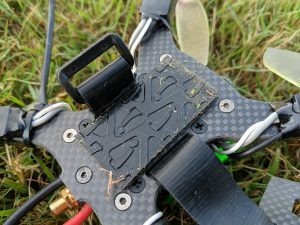 Frames like the FLOSS 2 are a popular style now, and are very important to prevent from ejections since the battery will head directly into the path of the props if it does. With the Ummagrip and a quality rubberized strap, I’m confident it’s not going anywhere. It’s solidly locked in place, and any crash with enough force to remove it is likely to damage it pretty badly otherwise as well. I haven’t ejected it yet. This is a typical amount of schmutz after a single flight on the bottom-mounted Kopis 1. The Kopis 1 is a great quad, but I’ve had more battery ejections with it than anything else I’ve ever flown. It seemed like a good test case for the Ummagrip. I think the problem comes down to a poor strap that has little holding power, and a foam pad in the battery area having even less. I replaced the foam pad with a larger piece of Ummagrip. Right away, I felt a strong improvement over the stock foam. But the Kopis is a bottom-mount frame. Flying the Kopis adds dirt, grass, and debris to the pad every single time. To keep its original function it must be cleaned after nearly every flight. My test day was hot and extremely humid. There was a very notable decrease in adhesion vs. what I’d seen on the bench. The moisture in the air may have caused some grip loss, similar to washing it. I crashed the Kopis twice that day; once the battery held, and once the battery ejected. The ejection didn’t surprise me; between the dirt and humidity by that point there was little grip left. I wasn’t able to replace the battery strap with something better and try again; my Kopis frame broke before I had the chance. 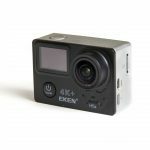 This block of wood action camera mount always seems to be a conversation piece. My Wizard frame still attracts attention for its action camera mount, which is nothing more than a triangular block of wood cut at an angle and paired with a Velcro strap. (It’s what was in the shop at the time.) Previously, I had some dual-lock tape atop the block with a strip on the bottom of my Runcam2. The dual-lock worked really well, but with a lot of abuse the lock nubs started to break off. Having the lock strip on the camera also meant I lost access to many mounting options for the camera, including its cradle. Adding Nomojel to my quad’s mount meant that I could free the camera of the dual-lock and more easily use my Runcam2 for other things. It may also be providing some amount of vibration reduction, but I doubt that particular benefit is significant when the camera is firmly strapped in place. Several crashes later, the Nomojel has proven its utility. With nothing more than the pad and a strap that came with the camera, I’ve yet to suffer a single ejection. The Nomojel definitely grips better than its thinner battery-holding counterpart. At times, it’s even somewhat difficult to remove. Here’s the big question. The pads work, but is there really a big benefit over a cheap roll of hook-and-loop tape? These pads are a few dollars each—$4 for the Nomojel and $5 for the Ummagrip—but a 10ft roll of industrial Velcro tape is only about $10. I don’t think the durability of either material is a concern. I’ve damaged Velcro tape in crashes, but never so much that I had to replace it. The batteries always fail before the Velcro does. The sticky pads will need more maintenance—wiping down frequently and possibly needing protected from picking up dirt in transit, but this is a quick task. Cost-wise, it’s hard to argue that the pads would be a better deal for many people—you’d have to replace about 30 batteries without replacing your frame. I don’t personally know anyone for which that would be true. The need to keep things clean is a mark against the sticky pads, whereas my Velcro-equipped quads and batteries just keep on going without another thought. The issue with humidity may be a bigger concern for some than others. Up this way, we never know what we’re going to get. But if you buy a new battery and have Ummagrip, you can just charge it and go. 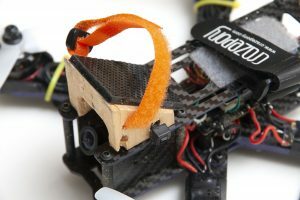 With a roll of Velcro tape, you’ll need a few moments at the bench to cut and apply it before you’re ready to fly. 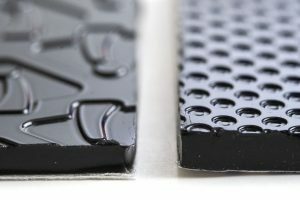 A comparison of thickness in each pad. Ummagrip left, Nomojel right. Paired with a good strap, the pads offer at least the same grip as Velcro and possibly better depending on the environment and how clean they are. This allows pilots to buy batteries and use them without worrying about buying and attaching Velcro before flying. You can even be confident if you throw on a borrowed battery. There are a few video stunts where the pad is used without a strap at all, and it works. I talked to a number of pilots with Ummagrip installed (or a Remix frame) and they all love the grip pad. The pads lose their grip when dirty, just after washing, or in high humidity. Without pairing up a quality battery strap, you can still get ejections. 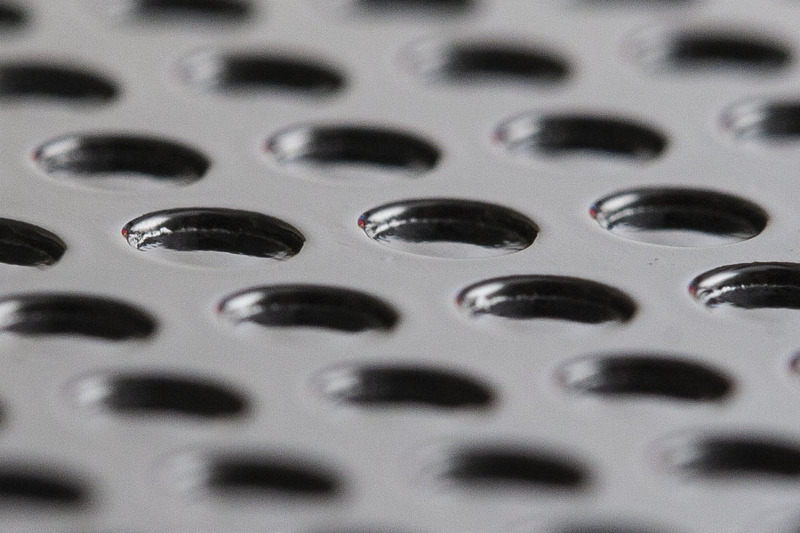 When bottom-mounted, the pads get dirty easily and need cleaned often. All of the people we talked to (who all loved the pad) had their quads set up with top-mount batteries. Our recommendation is to pick whatever works best for your situation: Ummagrip for convenience, Velcro for cost, or Dual-Lock for somewhere in between. With any of these, there’s no substitute for having a decent strap that has a rubberized surface. RaceDayQuads practically gives these away—as of this writing they’re only $1, and one comes free with most orders. The Nomojel makes a compelling case with fewer caveats. It was much grippier and more resistant to humidity and random field debris, and I’ve never seen a bottom-mounted action camera. If anything, the Nomojel is borderline too sticky—at times it can be hard to separate. 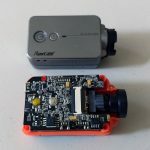 There’s an added benefit to not having anything like Velcro or Dual-Lock permanently attached to an action camera: it can continue being used in a variety of mounts for recording other activities or off-quad b-roll at races. Even a small rubber-less strap was enough to pair with on a humid day and hold everything in place through some rough-and-tumble crashes. 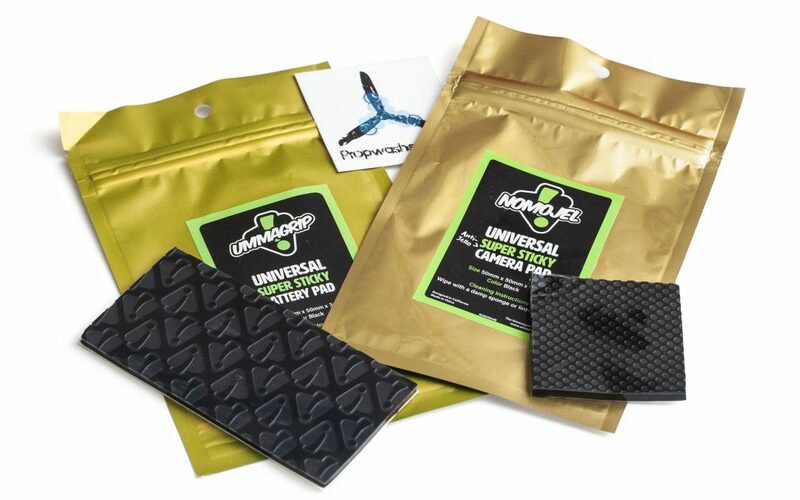 Both Ummagrip and Nomojel are available from RaceDayQuads and Rotor Riot.